Thanks Dave, that was my take on it too, but only based on what I've read, not any real experience till now. Yet another good idea. I have some pickling solution - I'll have to pull that out and use it. And I've got a tin I can use for annealing. Also and excellent idea! Hi Kim, the last rivetting job I can remember, were some brake linings on a lorry drum brake, 20 or more years ago. So I am following along. Well, even though I wanted to get on with the build, I decided I still wasn't comfortable with how my riveting was working out and I needed to work on that a little more before moving on. 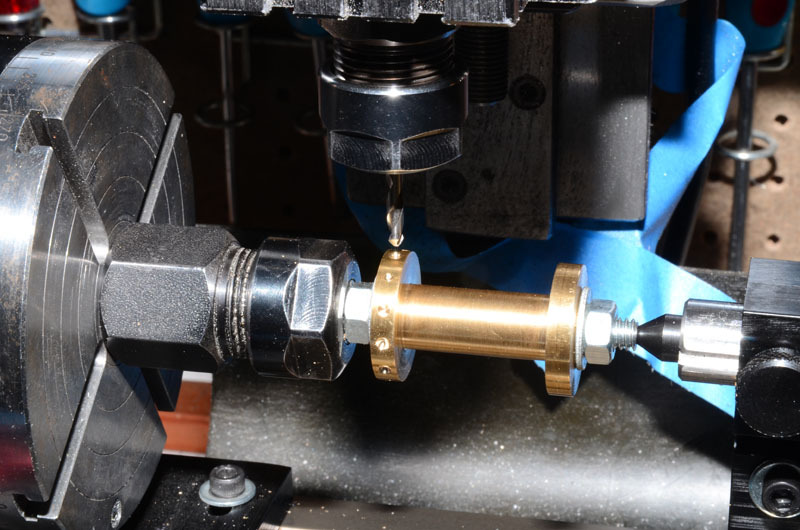 One problem I was having is that when trying to form the rivet head, the rivet shank would usually bend over to one side and cause the formed head to be a bit weird and off center. Luckily, Dan sent me a pointers to some additional information on riveting on another site that helped me see a step I was missing. 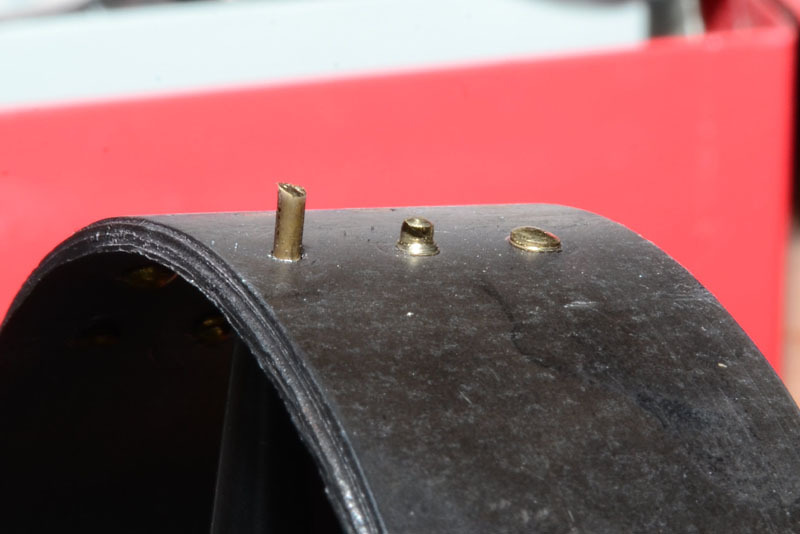 The post that he pointed me to showed a 'setting' tool that compacted the rivet, broadening it to fill the hole and setting it in place, but not forming the head yet. This seemed worth a try. On reflection, I see that Stan talked about that same tool, but I didn't understand it. He had three tools - one to make sure the rivet was solidly in place, one to do the initial setting and broadening at the base, then one to form the head. So I made two new tools, and now have the same set of three punches that Stan described. Turns out that this system really works well! Go figure. Guess I'm just a slow learner. Right: The right most tool has a deep hole (3/4" deep) just bigger than the shank of the rivets. 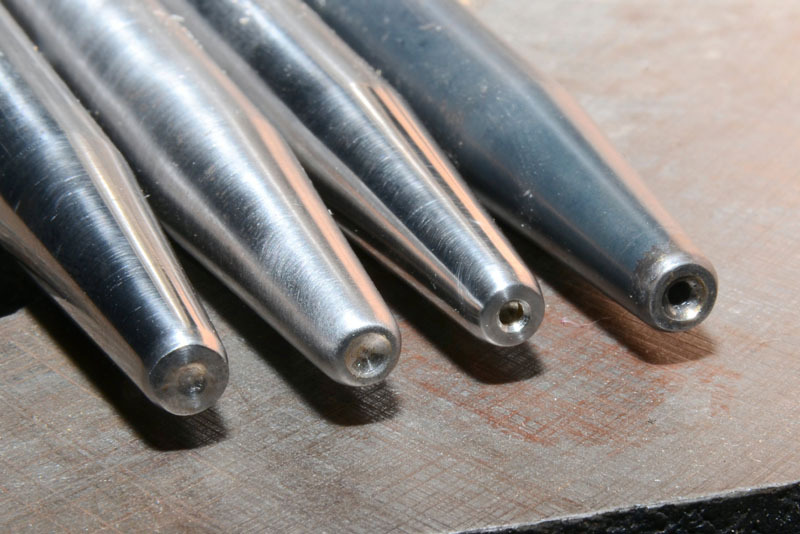 It is used for making sure the formed head of the rivet is tight against the other side and that all layers of material are making good contact. 2nd from Right: The next tool is the 'setter' and it has a hole just a little deeper than the diameter of the rivet shank. 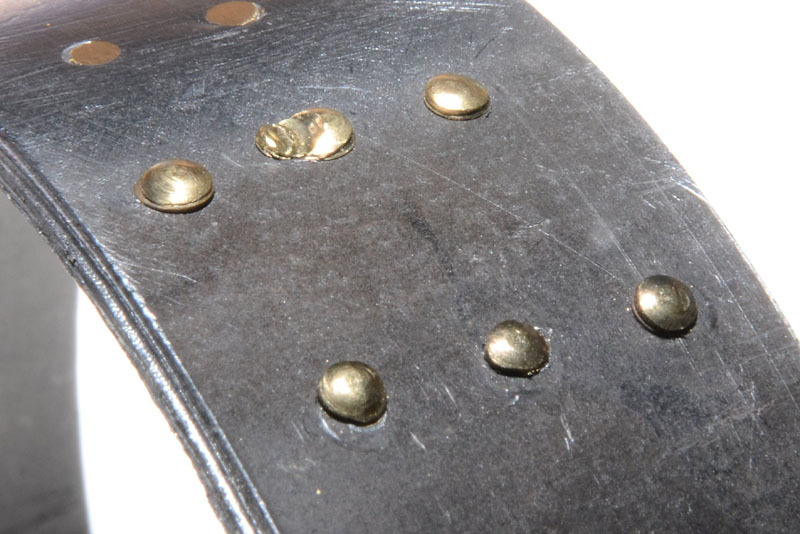 It is used to spread the rivet in the hole and broaden the base. This one really makes the rivet tight in place and compacts it into place while keeping the rivet shank from bending. 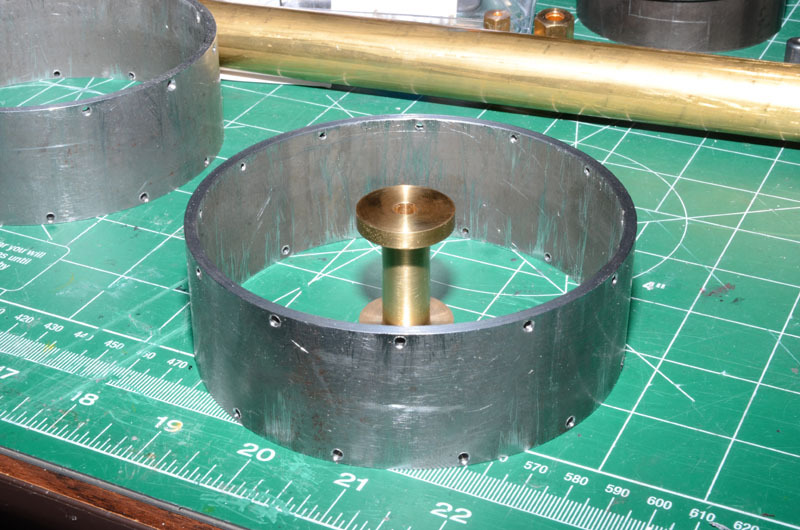 3rd from Right: The next one forms the rivet head. Left: The last one is the more flat one I use for when I just need a flater faced rivet. 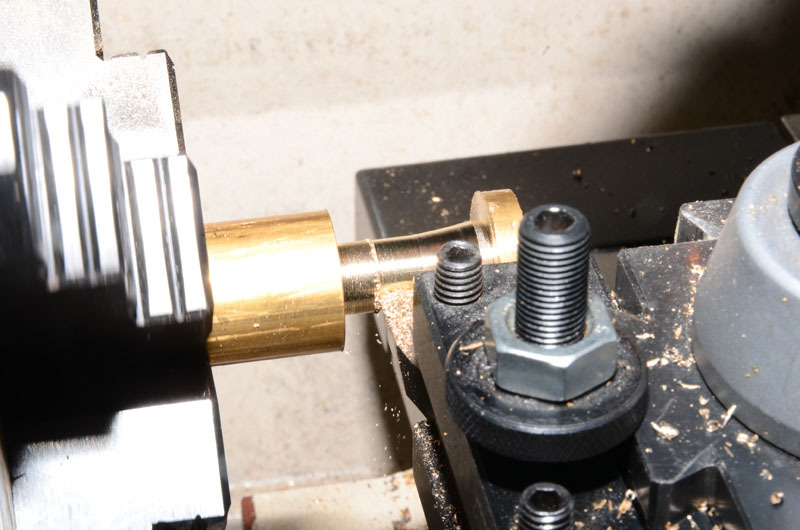 Before I used my new cool tools, I needed to anneal some more of the escutcheon pins to use for brass rivets. And this week I'd just gotten a new oxy-acetylene welding outfit. This is something I've been meaning to try and for some reason, now was that time. I thought I'd use that to do the annealing. Boy, that torch gests WAY hotter, WAY faster than my little Bernzomatic. I heated them up in a little tin, but I obviously got them way too hot. I'll probably go back to the Bernzomatic for annealing :/ I was able to salvage about 3/4 of pins. Made me feel a little silly. 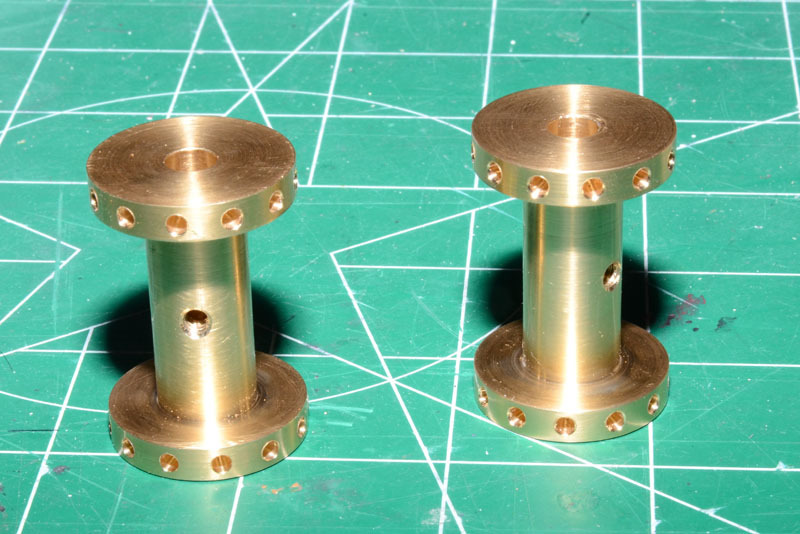 Following that fiasco, I went back to my test piece and drilled holes for more riveting practice. 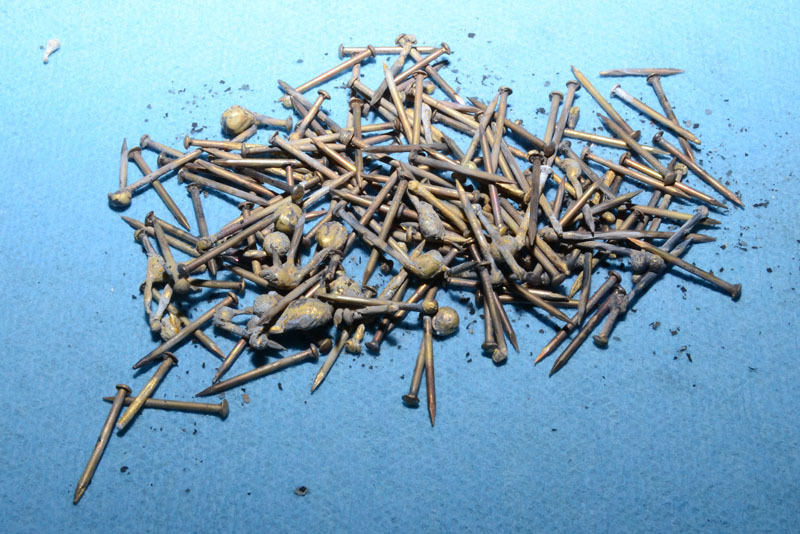 Here's a row of rivets. The one on the right has been cut to length and seated. The middle one has just had the setting tool used on it. You can see how it has been compacted down and spread out at the base, but it is still VERY straight and not bent at a weird angle. The last rivet is shown after forming the head. Here's a couple more practice rows done. This three tool approach works really well! You can see that in the middle of the top row I didn't keep the head forming tool centered - it jumped off the head and I kept pounding away. I was more careful of that with the rest of the rivets. Here's the inside of the rivets. Top left one has that same problem - I didn't keep the bottom head in the right place on the anvil. Using this tried and true three tool method, setting the rivets went very well, despite a few blunders. And even though it was hard not to move forward with the build, I'm glad I spent one more session working this out. I think it will really help as I move forward. Your doing great Kim, just keep practicing until your comfortable doing it. The three tools is almost a must for proper rivet setting and I am surprised Ruby didn't mention it in his book. 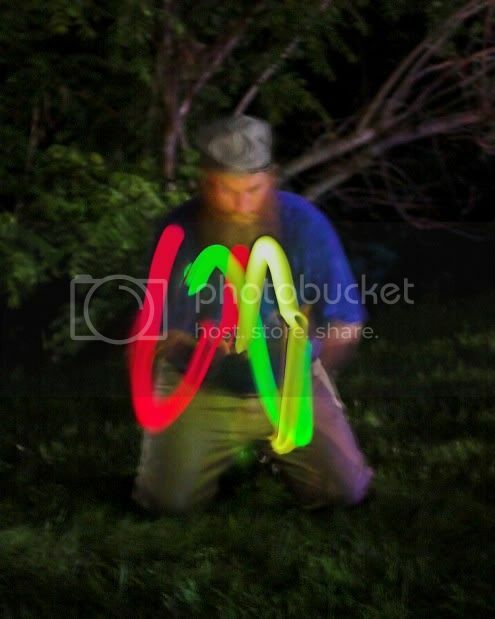 A hint on using your new torch, you should have an assortment of torch tips. Start with a smallest tip and low flame and increase it as you need it. Once you get use to it, it will be second nature. Hi Kim, thanks for showing your learning curve. Something I have to keep in mind. Yeah, for me, its ALL practice. I'm excited to start using it on the model. Thanks for the advice on the new torch Don. I was just using the tip it came with (a #0). I''ve ordered the #00, and the #000 which I think will be important for the size of work I do. But needless to say, they haven't arrived. Yet another new toy to learn how to use. More fun! Kim, looking at that cut rivit I would say you have them too long, for a normal half round "snap head" rivit you need approx 1.5Dia, yours being flatter probably need less. I've never felt the need to use an intermediate tool, the first tool is actually called the "set" not the second one. Thanks Jason, I'll get my terminology straight someday! So the first tool is called a set. 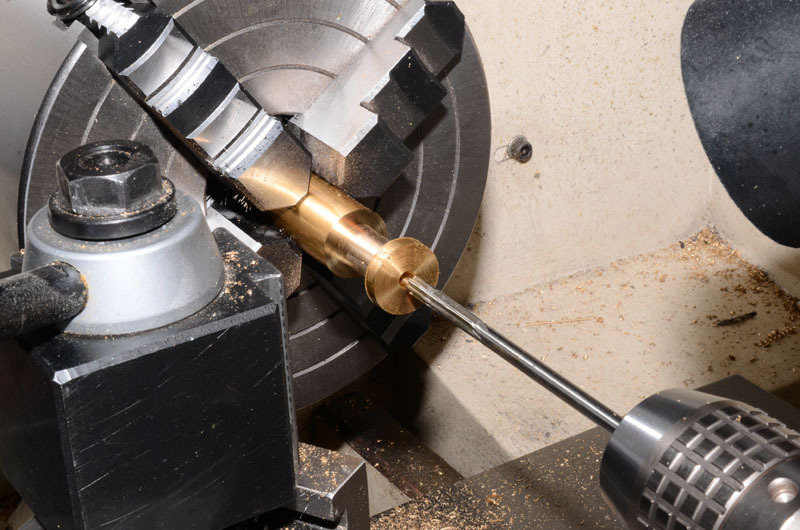 What's the intermediate tool called? Does it have a specific name? Or the third one (the head forming one)? At this point, I've got a process that I'm fairly pleased with, and have the items I need to execute to that. 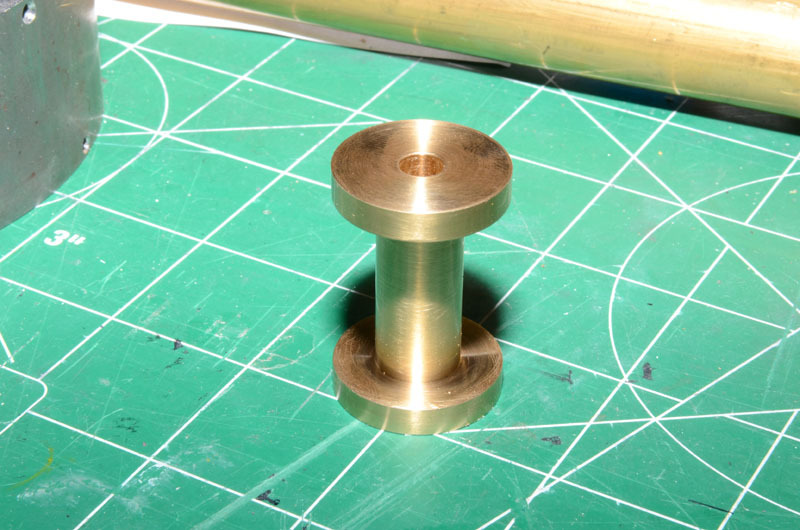 So for this project, I think I'll just go with the brass pin's I've got. But you are right, I think I'm leaving too much material when I cut them. I was aiming for about 1.2x diameter, but again, I think that's too much. Maybe I'll try 1x and see how that goes. If I do that, I'll have to make my second tool shallower though. Its 1x diameter deep now. I'll have to shave that down to .7x or .8x diameter. And thanks for all your help on the riveting, and terminology and such. I really appreciate it! I always make a gauge to cut the rivets to length. I simply take a piece of stock 1.5 times the diameter of the rivet body and drill a rivet hole in it. 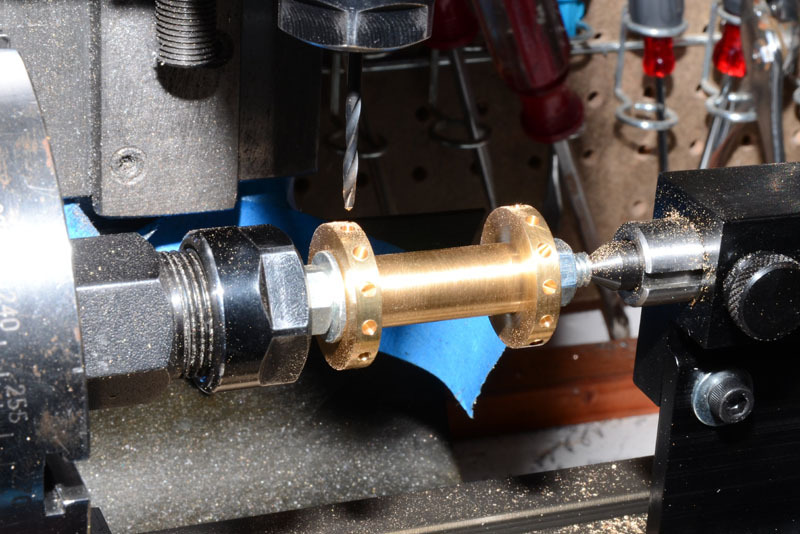 Install the rivet and then the gauge and use a flush cutter to get consistent results. The final tool is known as the "snap". I'm not sure if there is a tern for the intermediate as they only seem to be used by some model engineers rather than something that is used in engineering. As I said 1.5D is a good general starting point for a normal "snap" head rivit though the actual allowance for BS small rivits is 1.429D but this does depend on teh actual snap you are using and also how close a fit the rivit is in the hole. Thats why its best to start at 1.5D and adjust to suit your work. 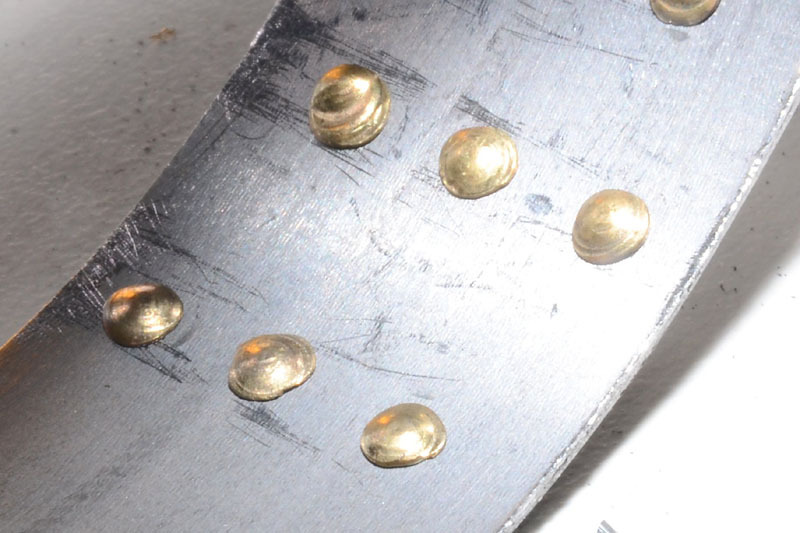 What a terrific thread outlining the trials and tribulations on the art of setting rivets. Thanks Kim. I have yet to attach the gaiters to the rear wheel rims and this is helping me to see what to, and what not-to do in the process. I'm enjoying this tremendously.. I work in aviation and the formula we use for the length of the rivet is 1.5D of the hole. When done right the shop head of the rivet should be 1.5D of the hole wide and between .5 and .65D tall. TThanks Jim and Tony! Sorry for the long delay in response here. Wow, I just checked, and it's been 3 weeks since I posted an update! I've not had a lot of time to work, but I have made some progress. So let me take a moment and catch my build log up to present. After my 'riveting interlude' I'm ready to get back to making the rear wheels. A few episodes back, I made the rims for the wheels, now I need to make holes for all the spokes. Here's how I tackled that problem. 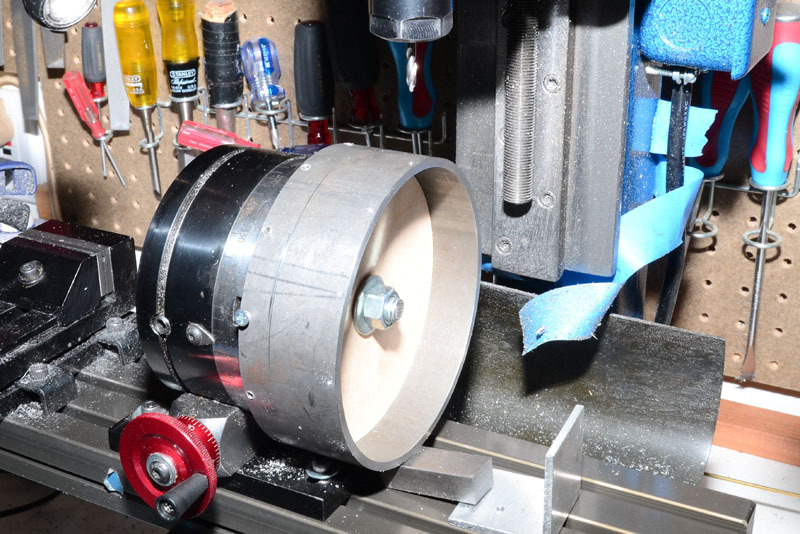 I took a scrap of plywood, roughed out a circle of about the right size on my scroll saw, then put it on my lathe and turned it down to a tight fit for the rear wheel rims. This was a mess. I got wood dust all over my nice clean lathe! 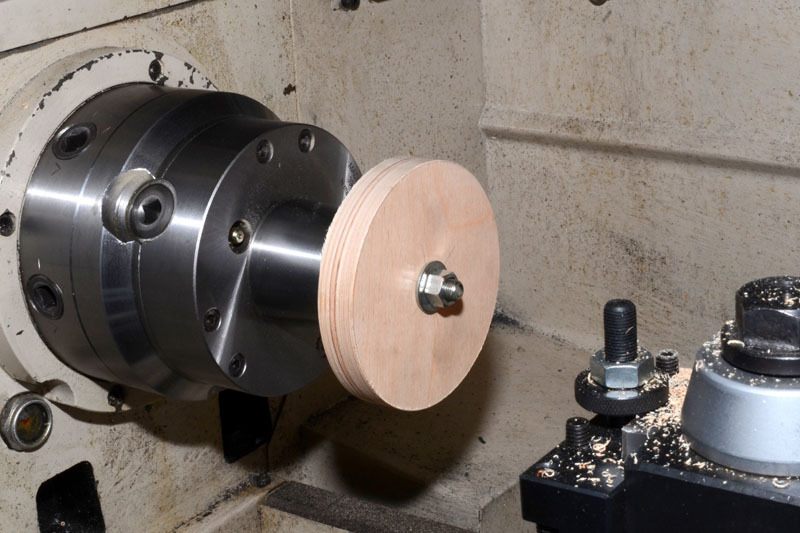 Next, I moved that assembly over to the rotary table. 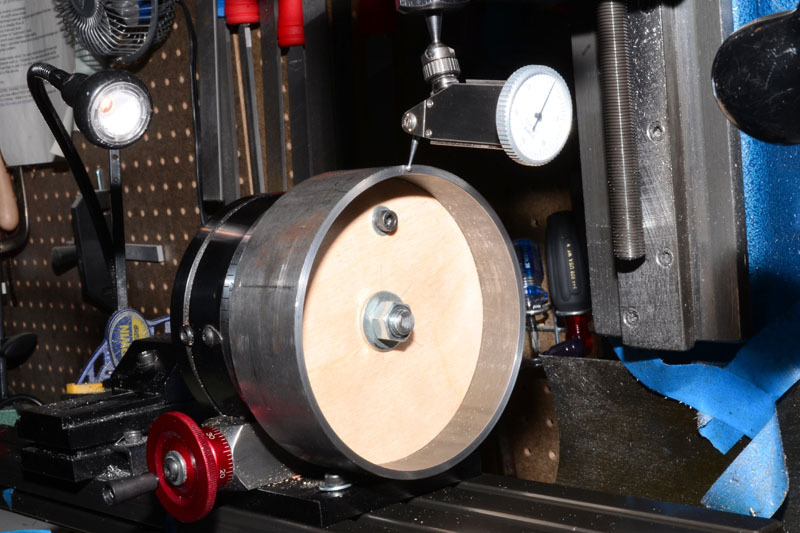 I added a screw in the middle of the wooden disk to keep from turning on the RT, then trued it up on the mill. With this setup I proceeded t drill 3/32" holes every 30 degrees around the rim. After the first hole, I put a little screw through the rim into the wooden disk to prevent the rim from slipping. 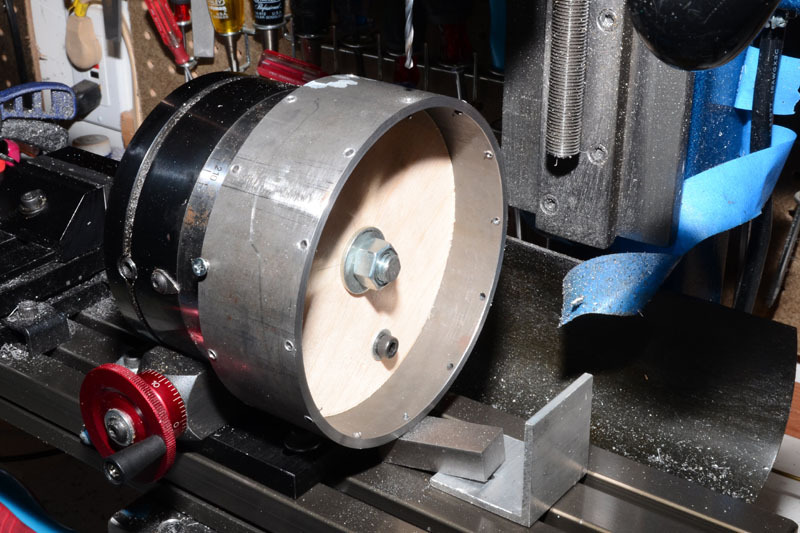 I also wedged a piece of scrap under the outer edge of the rim to provide some support while drilling. The Sherline RT was JUST barely big enough to handle this. The wheel rim is 4.5" in diameter. And while that cleared the base of the RT, the screw I put in the rim didn't. So I had to move that screw to different holes as I rotated the wheel. This made the whole operation a little more interesting. After completing the 12 holes on the inside, I moved to the outer side and drilled the next 12 holes. These were also drilled every 30 degrees, but 15 degrees out of sync with the other side. This shot shows all the spoke holes complete. With the wheels complete, it was time to make the hubs. These started as 1" round brass rod. 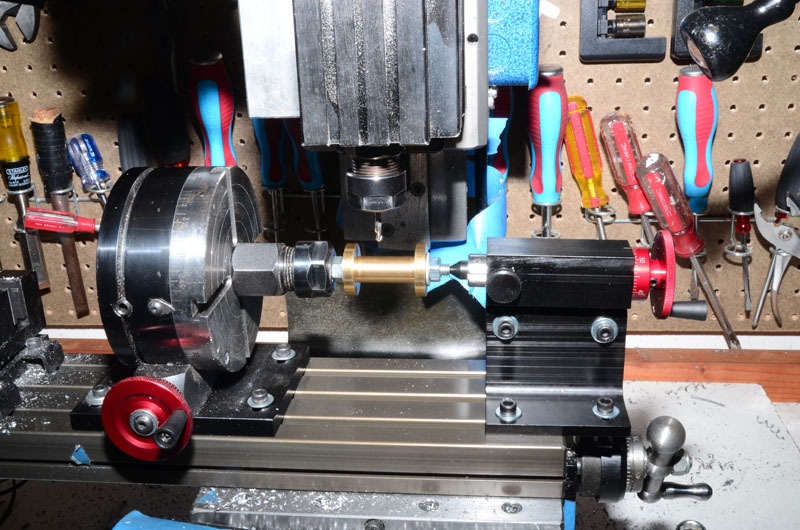 This is a shot just after I drilled and reamed the 1/4" hole for the rear axle. 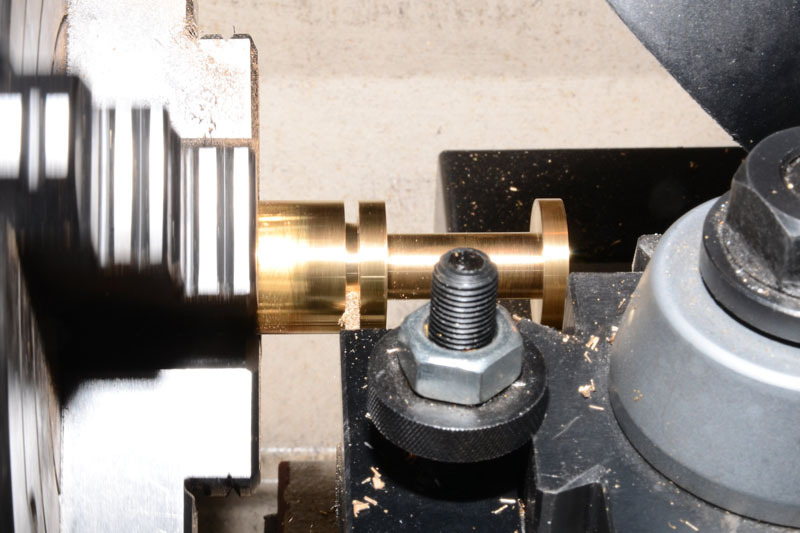 Then I took the center of the hub down to 1/2" alternating between LH and RH tools. And finally, parted it off the stock. Following parting off, I flipped it around in the 4-jaw and faced off the newly parted end to get it flat, and to size. Do other people have that problem? When I make a parting cut, it always leaves a bit of a convex surface. Always. No matter how carefully I line up the parting tool, the cut just doesn't come out flat. Its probably got a 10-15 thousandths dome. Is it because of the slight bevel on the parting tool? Its not a big deal, I just part a little long and face off to the right length. I'm just curious if I'm doing something terribly wrong, or if this is standard practice for others too. And here's my preview of what it will look like, eventually! Imagine 24 brass spokes in there! Looks pretty good, eh? 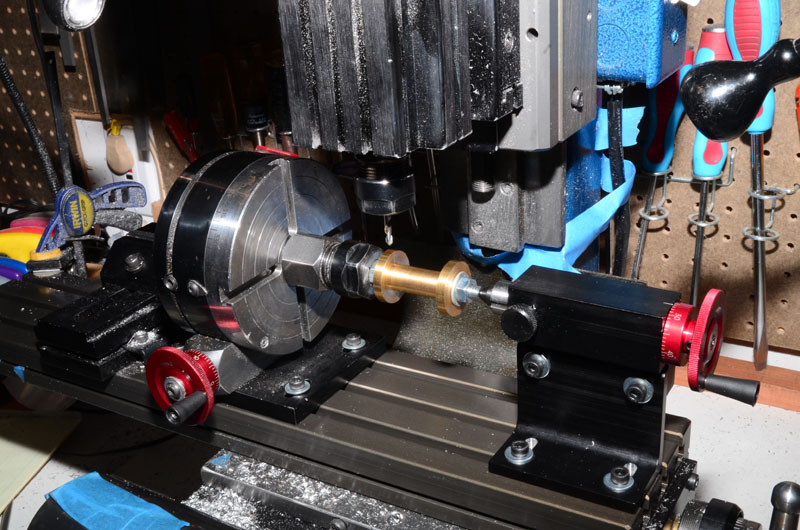 I was pretty please with myself till I realized I was too close to the end of travel on the x-axis and I couldn't reach the outside edge of the hub So I spent the next hour of shop time moving the whole setup an inch to the left and squaring everything up again. This time, it worked. Here's the first 12 spoke holes spotted. And here's all 24 of them drilled. Again, the holes on the far side are 15 degrees off from the holes on the near side. 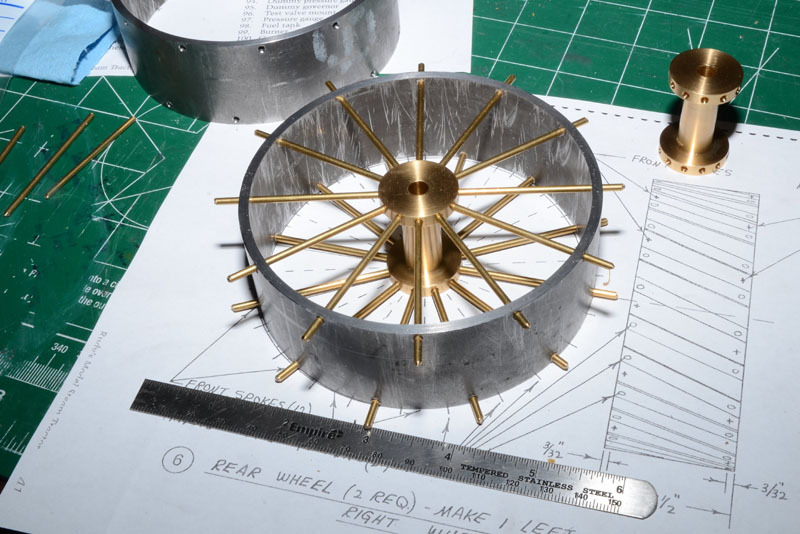 I cut 24 spokes from 3/32" brass rod and did a quick test assembly; now you don't even have to imagine the spokes! Looks even better than I'd imagined! Next up is figuring out how to solder them in place. Rudy says you can just soft solder these in place, but I'm thinking I will try and silver solder. Its time for me to stop being scared of silver soldering. You have been busy and the parts look great! I think silver soldering those thin brass spokes to the rather heavy steel rim may end up being a real challenge; possibly keeping the heat only on the outside of the rim to avoid over heating the spoke may help. Might be a good idea to make up some test parts and give it a try. I think I would go for the low temp route and use Harris Sta-Brite solder and Sta-Clean paste flux. Bad Behavior has blocked 16036 access attempts in the last 7 days.